This is one of those Gospels that, when I proclaim at the end, “The Gospel of the Lord”, you might be tempted to respond, “Praise to you, O Christ?” [with questioning inflection in voice]. Wow! What’s all this talk of fire and division — households deeply divided, no less!? How is that Good News? Gospel? It seems a good week, then, to say what needs to be said: Sometimes — perhaps most of the time, if we are listening carefully enough — the Gospel is challenging as hell. I’m well aware that the word “hell” might give a little jolt, since it is often considered a minor cuss word. But I’m using that word intentionally today for that very reason — to give us a jolt. And I’m using it quite literally, too, if you remember our reflections last week on the sense of urgency in the Gospel. It used to be that the urgency to Jesus’ message was most often heard with the threat of hell behind it — that if we don’t believe in Jesus when we die, we are in danger of God sending us to hell for eternal torture and punishment. But as I indicated last week [in a sermon extemporized from a blog], I consider that to be anti-Gospel. God is not violent and conflictual. We are. God doesn’t send us to hell when we die. We make hell for ourselves here on this earth. In fact, today’s Gospel Reading gives us that exact picture: households deeply divided. Hopefully, not many of us here have had to endure such divided households for long. But even when it’s for short periods of time, it can be like living in hell, right? There’s few things worse than feeling cut-off from the people we love the most. Now, Jesus says he comes to bring such division, such hellish conflict. What on earth does he mean? We need to be clear from the start that he does not mean he’s bringing it on purpose. The division that happens is an unintended consequence from the Gospel being challenging as hell. It challenges and begins to dismantle the structures we human beings have put in place to help keep the peace in our households. But those structures — such as sexist ones that favor the man in the household — have been unjust and in need of challenging. So as the cross begins to challenge them and bring their downfall, our households won’t have those ways of keeping the peace anymore and so will become more divided — unless, unless we take up the new just ways of keeping the peace which Jesus also came to bring. That, no doubt, still sounds awfully confusing, and we will back-up and explain it more step-by-step. But let’s first pause for a moment to consider another prominent aspect of the Gospel that’s challenging as hell. I propose to you that the chief reason is that the Gospel is primarily about transformation. 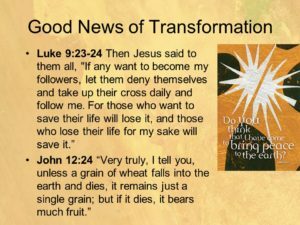 We are to be transformed into new human beings, which is Good News. But transformation also means a dying and rising. The old human being has to die and the new one arise. Dying and rising! That’s why the Gospel is challenging as hell! Let’s look for a moment at how prominent a theme this is. In Matthew, Mark, and Luke, Jesus talks a lot about things like taking up our own crosses if we want to follow Jesus. Or those wanting to save their lives will lose them; while those willing to lose their lives with Jesus will save there lives. Losing your life to save it. Being transformed. In John’s Gospel, we get it a bit differently, about a grain of wheat dying in the earth in order to become fruitful. John’s Jesus also talks about Jesus being the vine and we the branches, so that we abide in Jesus. This is similar to St. Paul’s talk about living in Christ, and Christ living in us. It is all language about transformation. Jesus, who came to show us how to truly be human, means to transform us into new humans like himself. That’s Good News, right? Except for the part about the old self dying. That’s the part which is challenging as hell. 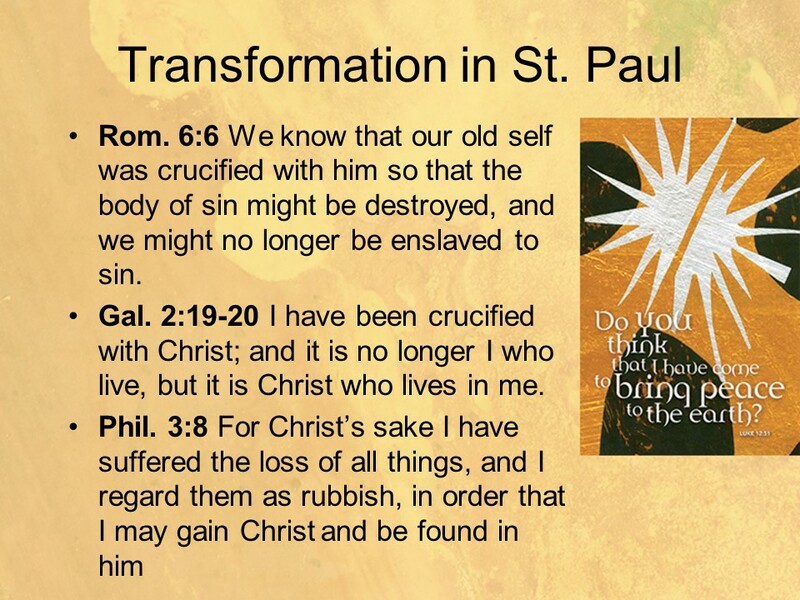 In taking a quick look at Paul’s language of transformation, I’m going to especially lift up the third one on this slide. The first two are quite familiar. One we use at funerals to remember that the process of dying and rising began way back at our baptisms, so we need not fear death. And the second we just heard a few weeks ago, when we were reading through Galatians. The third one here from Phil. 3 is most extraordinary, as it comes at the end of Paul bragging about how good a person he was. He was the sort of person that everyone looked up to. He was sailing through life, succeeding at everything he did. Until he met Christ, who demanded his dying and rising, his transformation into a new human being, one that has a wholly new measure of success. Paul says that he needed to count his former life as “rubbish.” Actually, the word there is actually, something like “crap” — or another four letter word for human feces. No kidding! That’s what the Greek dictionaries tell us about the word. When speaking about his transformation, Paul is using the strongest of language. He knows that this Gospel can be challenging as hell. And I think we need to understand the importance of Paul bragging about counting his former ‘successful’ life as crap. Because if Jesus came to transform even the most successful of human lives, he came to transform them all. This is what’s new, I think, about the Gospel message since I was growing up and learning it. When I went through catechism, the emphasis of the Gospel was on what happened to you when you die. Because Jesus forgives us, we finally become new persons in the heavenly kingdom after we die. On earth, we are still sinners, so we didn’t talk much about transformation. Jesus could tweek a few things here or there, making you a more loving person, perhaps. Or transformation seemed optional for only those times and situations in our lives when our sin was causing great harm — like if you are addicted to drugs or alcohol and ‘hit bottom,’ as they say. Then, one could experience transformation. But for those of us like St. Paul, who are successful in the eyes of the world, who journey through life without hitting bottom, I don’t recall us talking about transformation with the kind of passion of Paul. I don’t recall us examining our lives, basically successful in the eyes of the world, and counting them as crap so that Christ could live in us and make us a new person, with a whole new measure of success. Do you? So if you are like me, you probably find this transformational version of the Gospel to be challenging as hell. But let’s get to a sketch, a glimpse, of why the transformation is so drastic, virtually a dying of the old self and a rising of the new one. Why is it that Jesus comes to take away our old human way of peace that results in more division — unless, of course, we are open to dying and rising with him to a new way of peace? It begins with what we talked about a couple of weeks ago, that human beings desire through each other. Remember the little girl watching TV? It’s the advertisers on TV that understand us human beings well. They show us other people desiring things so that we catch their desires. Our desires are contagious. But the problem with this is that sooner or later, when we catch desires from each other, we find ourselves reaching for the same object of desire. It’s like the children in the nursery full of toys. How often do they end up fighting over the same toy? Unless they’ve already begun to be enculturated into deferring their desire — which we’ll get to in a moment. 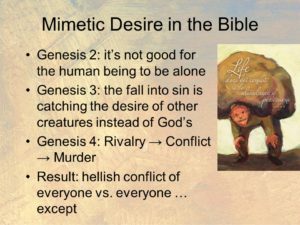 So right from the beginning the Bible shows us this picture about ourselves: the first man and woman caught their desires from the serpent, a fellow creature, instead of listening to God’s desire for them. So they end-up like the children in the nursery: rivals for the objects of desire. And the climate of rivalry and resentment very quickly turns to conflict — one son murders the other. Cain kills Abel. 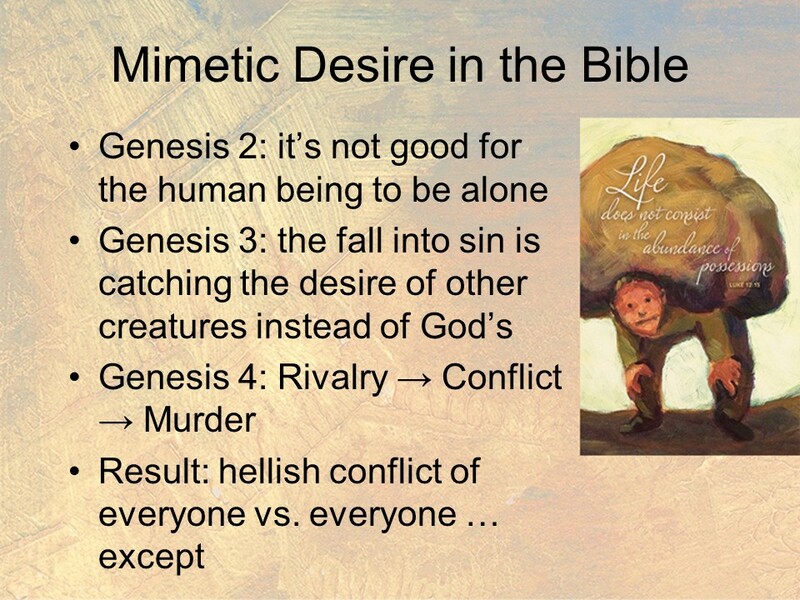 In other words, the story in Genesis shows us precisely our natural state because of sin, and it’s the same picture Jesus puts before us today: households divided, three against two, father against son, daughter against mother, and on and on. So the question becomes: how did we survive as a species if we are so prone to such hellish conflict, even and especially with those closest to us? I’ll skip a few steps and cut to the chase: the other dimension of sin that we’ve talked about in recent weeks, namely, the Law. 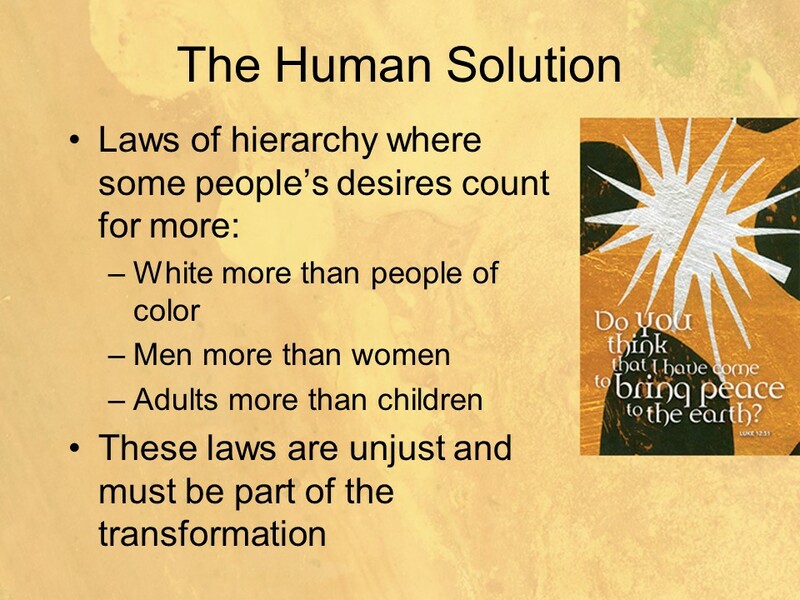 Our human law establishes hierarchies, ‘pecking orders,’ where some people’s desires count more than others. 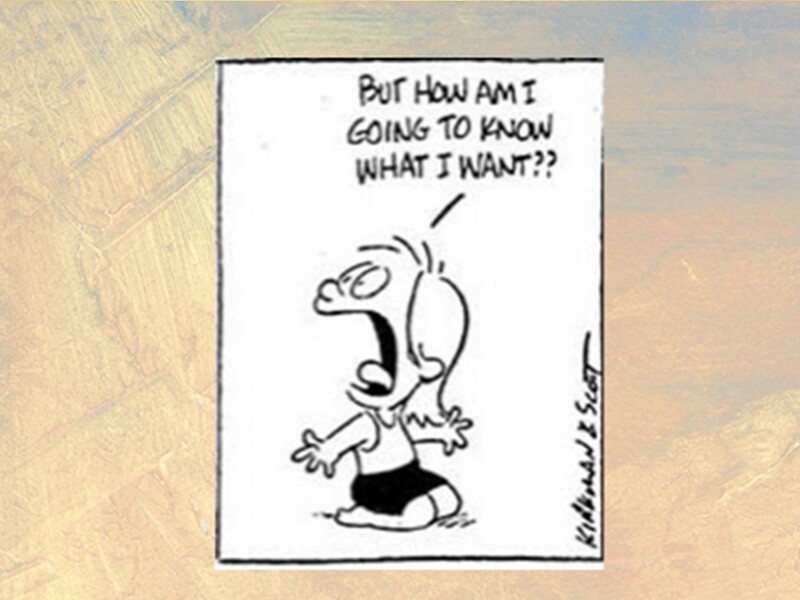 So those whose desires count for less are expected to simply defer to those ‘above’ them in the pecking order. When we find ourselves in rivalry over whose desire takes precedence, we follow the hierarchies prescribed to us in our cultures through the force of the law. 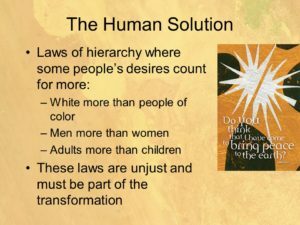 As we’ve talked about racism in recent weeks, then, we white folks are challenged by the fact that this unjust human solution to things has become woven into the fabric of society for 400 years. Our society has been built around the desires of white people taking precedence over those of people of color. In essence, our lives have mattered more. Black lives have mattered less. The Black Lives Matters Movement seeks to raise our awareness of this and to address the injustices still caused by it. And, yes, it’s challenging as hell to me as a white person. 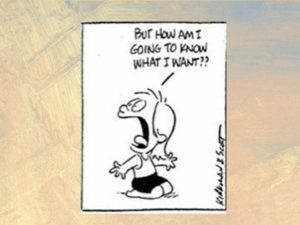 I need to become aware of the ways in which my desires are still privileged by the very power structures which determine whose desires hold sway. But here’s where we also become better weather forecasters, like the second part of today’s Gospel Reading. We learn to read the signs of our times. The Gospel is becoming more challenging to us today as we see the effects of its challenges to our various systems of power. Over the last 50 years, it’s also come home to roost among husbands and wives through our awareness of the injustices of sexism. If a husband’s and wife’s desires clashed in patriarchal times, how was the rivalry diverted? In a sexist culture, the man’s always took precedence, and the wife was expected to simply defer her desire to her husband’s. (In individual marriages, this sometimes worked out differently, even in the most oppressive of patriarchal cultures. St. Paul in Ephesians 5 is commending spouses to submit to one another within the patriarchal framework. The love of Christ can help these relationships play out differently than in the culture.) Similar hierarchies prevail among adults and children, and also among children by age. Younger siblings ordinarily need to defer to older siblings. But if these unjust structures are challenged or taken away from us, what happens? It can become the hellish picture of Jesus’ warning today — households deeply divided. Do you think that might be why divorce rates have gone way up since the women’s movement began to unravel our sexist ways of keeping the peace? What I’m suggesting to you today is that’s what Jesus is predicting in today’s Gospel. He came to take away our old, unjust ways of keeping the peace, and it brings more division before it brings peace. Because peace can only come through accepting God’s solution. Make no bones about it, God messes up our human way of keeping the peace by sending Jesus to the cross. Jesus came as a poor Jew on the fringes of the Roman empire. He hung with the wrong people, the people viewed as unsuccessful, people whose lives were counted as less. And, in his passion and cross, he let himself become the lowest of the low, a duly condemned and executed criminal. His life counted for nothing. Until God raised him on Easter, thereby exposing the injustice that runs throughout our human ways of keeping the peace, and thereby declaring a transformation of that structural, social part of being human, too — which is the hardest part of all to change, because it’s been our way of keeping peace since the beginning. It’s been our tried-and-true way of avoiding the hellish scenario of households divided, of everyone against everyone. And so the Good News is always first something that is challenging as hell. It is something that threatens to bring division, the most hellish forms of divided households. 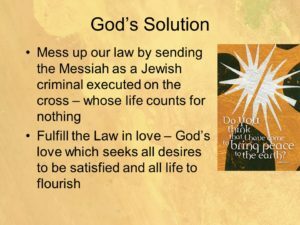 Unless we take up God’s solution — which is, of course, the really Good News. And so I also see many marriages and partner relationships which are bearing up under the challenge of losing our old way of peace, based on hierarchies, and finding their way into new ways of peace, based on more equality. Based on doing what it takes to seek the common good and help each person to flourish. It’s hard work! It’s challenging! It’s sometimes painful. But it’s worth it, too, when all involved find their way into flourishing.